First Weber is proud to announce that Kel Svoboda has been promoted to the position of Regional Manager, and in his new capacity will also serve on the Executive Leadership Team. 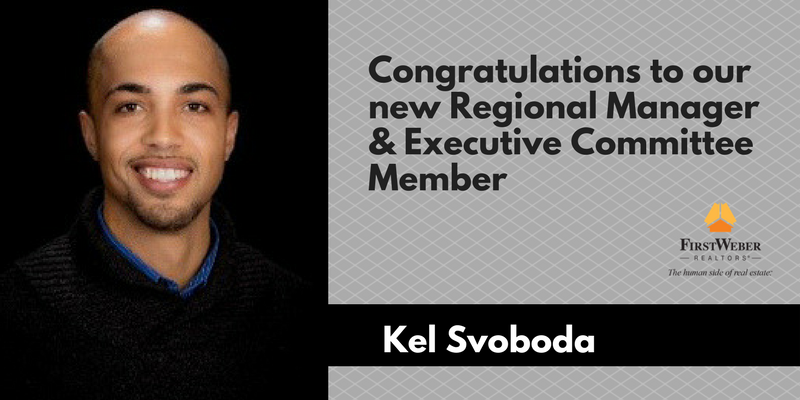 Kel has been in the Real Estate Industry since 2004 and in that time has seen many sides of the business as a Loan Originator, Title Closer, Broker Owner of Home Buyers Network Realty, and most recently prior to joining First Weber in 2016, Regional Manager for Century 21 Affiliated. Kel has been involved in organized real estate currently serving as a Director for the Greater Milwaukee Association of Realtors (GMAR) and having served on many committees for the GMAR, Wisconsin Realtors Association and National Association of Realtors. He has also served as Chairman of the Young Professionals Network (YPN) of Greater Milwaukee and Wisconsin and been a featured speaker for the GMAR and Realogy companies. Kel was also recognized as a 2014 honoree for Realtor Magazine’s 30 under 30 earning him the featured magazine cover.